A Howlingly Halloween Fundraiser! 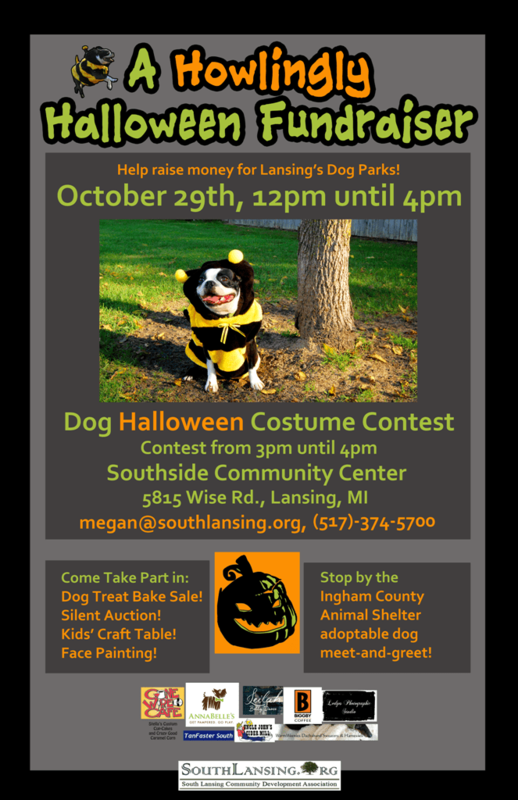 Help Raise Money for Lansing’s Dog Parks! Let’s Meet About a New Dog Park in Lansing! AnnaBelle’s is Walking the Dogs in the July 4th Parade! The City of Lansing’s Fourth of July Parade will be held on July 4th at 11 a.m. AnnaBelle’s Pet Station will be walking their dogs…along with rescue dogs available for adoption. H.E.A.R.T. (Helping Eaton Animals Resource Team) and F.M.D.P. (Friends of the Meridian Dog Park) will be walking with AnnaBelle’s. Interested in attending the parade? Check out the route! H.E.A.R.T. is a newly formed non-profit animal welfare organization, in the process of applying to the IRS to be a 501(c)3 tax-exempt charity. H.E.A.R.T. has accomplished some of its short term goals of purchasing items on the wish list of the county animal control facility, including oscillating fans for the kennel area and Kuranda dog beds. H.E.A.R.T. also has long term goals of providing a stackable washer and dryer and a fenced exercise area on the premises, along with establishing a medical fund and spay/neuter initiatives. Volunteers are needed to work at summer garage sales and other events. For further information call Helen at (517) 543-0288 or e-mail her at HelpingEatonAnimalsRT@gmail.com. The Meridian Township Dog Park will soon be part of Legg Park located at 3891 Van Atta Road. This is a beautiful 103-acre park within Meridian Township, just south of the Harris Nature Center. Please join F.M.D.P. and support the dog park project. The next public meeting is July 16, 2009 at 7 p.m. For more information, check out F.M.D.P.’s Facebook page! Help Make the Meridian Township Dog Park a Reality! Let Go of the Leash at Legg Park! The Meridian Township Dog Park will soon be part of Legg Park located at 3891 Van Atta Road. This is a beautiful 103-acre park within Meridian Township, just south of the Harris Nature Center. Please join the Friends of the Meridian Township Dog Park and support the dog park project. To become operational, the park needs fencing for two areas (large and small dogs), and a double-gated entryway. We plan on adding a water fountain, benches, and shaded rest areas for dogs and their owners. Now is the time to raise money for our fence, so…please, we need your help! Dog-loving volunteers lead by F.M.D.P. are guiding the development of the Meridian Township Dog Park! We need more volunteers and more help, and we’d love to have yours! If you are interested in volunteering with F.M.D.P. or would like to be added to our email list to receive park updates, please email us at greenway@meridian.mi.us or call us at: (517) 853-4610.